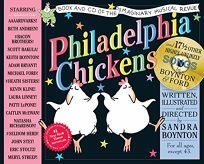 Sandra Boynton, long heralded for her menagerie of animal characters (Moo, Baa, La La La; Rhinoceros Tap), puts a fresh cast of singing, dancing critters center stage-from the titular boogying chickens to a tail-wagging ""snuggle puppy""-in Philadelphia Chickens, a book-and-CD package billed as an ""imaginary musical revue."" The first 32 pages contain lyrics and illustrations, the second half of the book includes musical notation and additional lyrics for each song. An all-star cast, including Meryl Streep, Laura Linney, Eric Stoltz and the Bacon Brothers, headlines the musical recording, which features a variety of original show tunes penned by Boynton and composed by Boynton and frequent collaborator Michael Ford. For more on this production see Children's Audio/Video, page 22.